Tobago offers the perfect location to enjoy Windsurfing and Kitesurfing from beginners to experts, for this reason, since 2003 Tobago Now has been organizing sport camps. Having a progressive professional structure, and the latest equipment of the best quality, we can accommodate windsurfers and Kitesurfers of different levels. 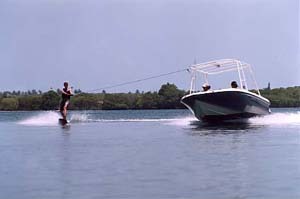 The Bon Accord Lagoon is the ideal location to practice this sport all year round. Here in the warm waters of the Caribbean the sea is always calm and perfectly flat. Between sessions the boat can drop you at Pigeon Point Beach, one of the most beautiful beaches of the Caribbean. There you can relax, catch the rays and enjoy great local food. 7 and 14 days camp: Hotel or apartment accommodation, training 5 days per week, 2 sessions per day, all equipment and transfer included.